don't ask. just a reworking of a recipe that should probably not have been reworked. thank bunchofpants for the delightful transcription which includes almost three pounds of frozen brussel sprouts, two cups of lima beans and a cuppa bleu cheese. what was i thinking? 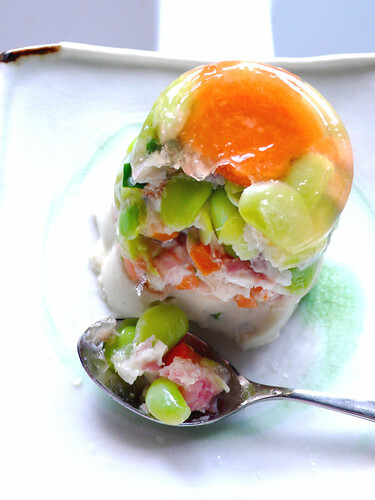 these congealed salads of yore were probably based on dishes of weropean origin involving aspic--basically a savoury meat jelly, yom---holding together scraps of ingredients that were too tasty or too pricy to throw away but not enough to make a complete meal. i doubt these cold molded terrines were ever meant to be eaten in great quantity, a fact lost on the creators of this so-called danish garden salad and the classic ring-around-the-tuna. i understand that again, economy is at play but can you really be saving pennies when the result is really unappealing? 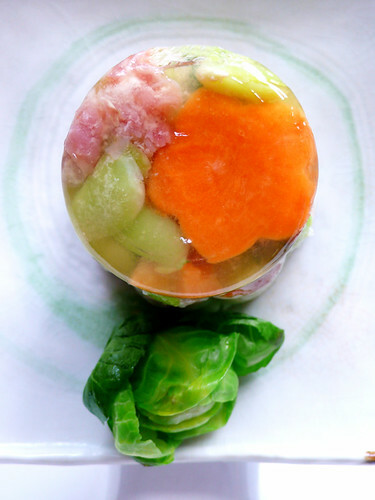 in an attempt to de-evolve (i don't think 'devolve' actually works in this case) the dish, i encased lima beans slipped out of their skin, finely diced zucchini, carrot and prosciutto, in a chicken broth-based aspic with just a tiny bit of gelatin, mixed in with a v. small amount of bleu cheese. however, there isn't an amount small enough that would make the bleu cheese work in this, it's a bad match with the spring-ish veggies and it even overwhelms the pork. the three tons of brussel sprouts are also a bad idea. however, even if neither were added, it would still be sort of blandular--a bland so bland that it actually hits a profound depth of nothingness. pretty, though.